Eurotunnel services have returned to normal following a day of suspended and delayed trains after a "massive invasion" of more than 100 migrants in the French terminal last night. 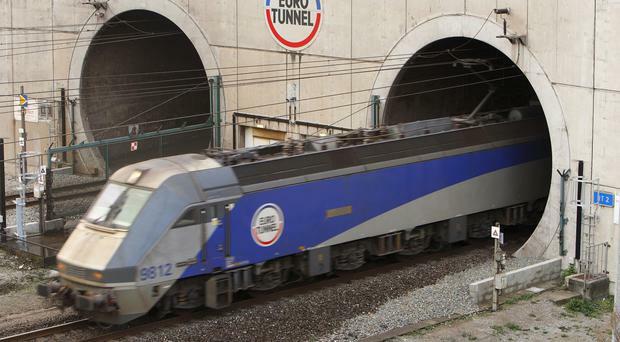 The operator was forced to close the Tunnel earlier today after a "large and co-ordinated" group stormed the track at Calais at around 12.30am local time. A spokesman for Eurotunnel said staff remained fearful of a second attempt at breaching the crossing. "We are all on tenterhooks and being very careful because it was such a different tactic, a different approach last night," the spokesman said. "We are on guard." Earlier the rail company had said: "It's clearly an organised attack when it comes in such a large number - there are over 100 in this one group. In reality this large a group had no chance of reaching the UK, so we see it as a way of getting media attention. "They arrived together and in a well-organised manner broke through the fences, and all clearly knew where they were going." Several Channel Tunnel staff and two police officers were injured in the incident and police in France are believed to have arrested up to 100 people. A spokesman said workers were hurled to the ground and had stones thrown at them. Services resumed at around 8.30am GMT but delays continued throughout the day but Eurotunnel said trains were now running on time in both directions with "virtually" no queues. Last night British authorities worked with French police to clear the tracks, said Eurotunnel. A spokesman for Kent Police said: "Officers were on standby to assist, but were not required as French police contained and dealt with the incident on the French side of the tunnel." Eurotunnel has implemented extra security to try to prevent migrants getting on the tracks. "Quite probably because the security at the tunnel is strengthening every day, with the new fences being put up, new security installations and additional staff, it's becoming much harder for migrants to get through in small numbers," the Eurotunnel spokesman said. He added: "This looks like quite a carefully co-ordinated and organised attack, possibly to raise the profile of their situation or as a last-ditch attempt before the new fences are up." The spokesman said: "They ran through the terminal, knocking some staff to the ground and throwing stones at them. There are some minor injuries to staff and also two police officers. They were treated at the scene by paramedics. "The large migrant group is now out of the way," he added. "The police have removed them and taken them into custody. "This is unseen before and a very determined and clearly organised attack with no fear of security forces or police." It is believed around 200 people tried to storm the tunnel but 80 were held back by security staff. The area where the break-in occurred is currently having high security fencing installed, Eurotunnel said. "Police officers were sent into the tunnel to prevent the group crossing to the UK," the spokesman continued. Thirteen migrants have died trying to reach Britain since the start of the crisis in June. An Eritrean man in his 20s was killed on Wednesday and is believed to have been hit by a freight train near the tunnel entrance at around 1am. Early on Tuesday morning a 20-year-old Iraqi man was crushed to death after apparently sneaking on board a lorry to reach the UK. The HGV driver discovered the body in the back of his vehicle near Calais port as he inspected his load after he was forced to brake suddenly. An estimated 5,000 migrants displaced from countries including Syria, Libya and Eritrea are believed to be camped in and around Calais. At its peak, the number of attempts to board lorries or trains was around 2,000 a night but that has since fallen. The crisis in Calais is part of a wider migrant surge in to Europe from countries in North Africa and the Middle East.